When Ford came out with the Ranchero I’m not sure they had an idea of how big a cultural icon they had created but it took the people across town from Ford to really make the idea of a pickup based on a car platform stick. 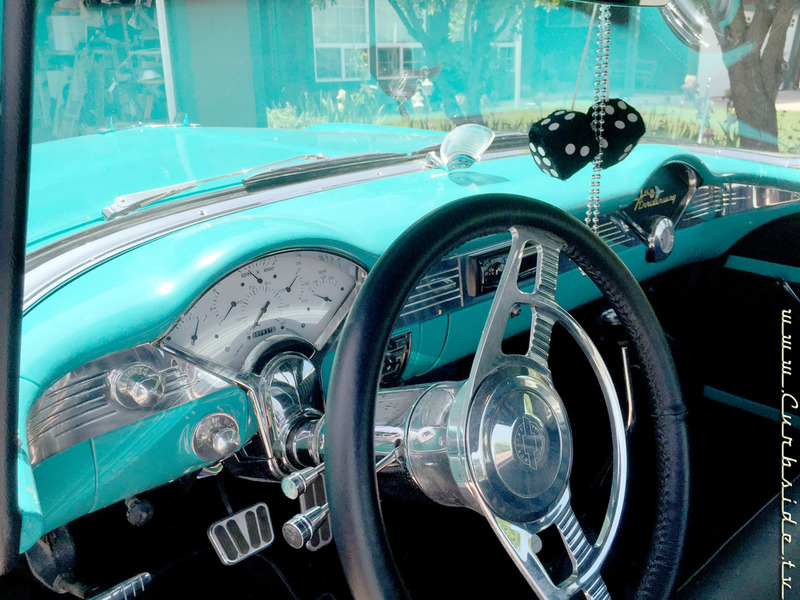 In 1959 the first El Caminos rolled off Chevrolet’s assembly line and while the sales numbers of the pickup based on their full-size Chevrolet Impala platform weren’t staggering, somehow they created an icon. Today there are no longer pickups being built on passenger car platforms in the US, although you can get them elsewhere in the world. 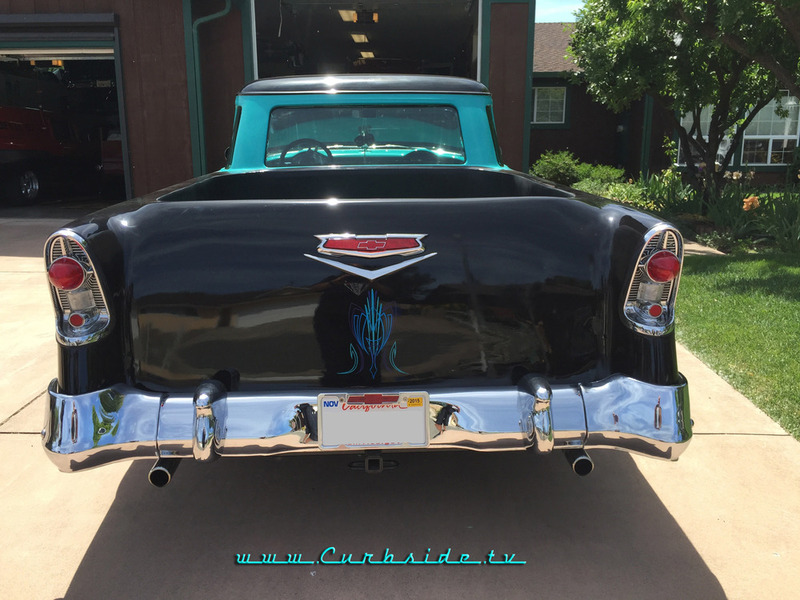 Chevrolet has not had an El Camino in their new car showrooms since Love Shack was a chart topper but that doesn’t mean you can’t still see new vehicles badged as El Caminos including this week’s featured ride, Joe Colabella’s 1956 Chevrolet El Camino. Some of you have already skipped back to the top to re-read when the first year was for official El Camino production and that was, in fact, three years after this car rolled off the assembly line the first time. But I’ve already written about how great a platform the tri-five Chevy is as either a restoration project or the canvas for some hot rod creativity so this week’s car falls into the ‘canvas’ category for sure. 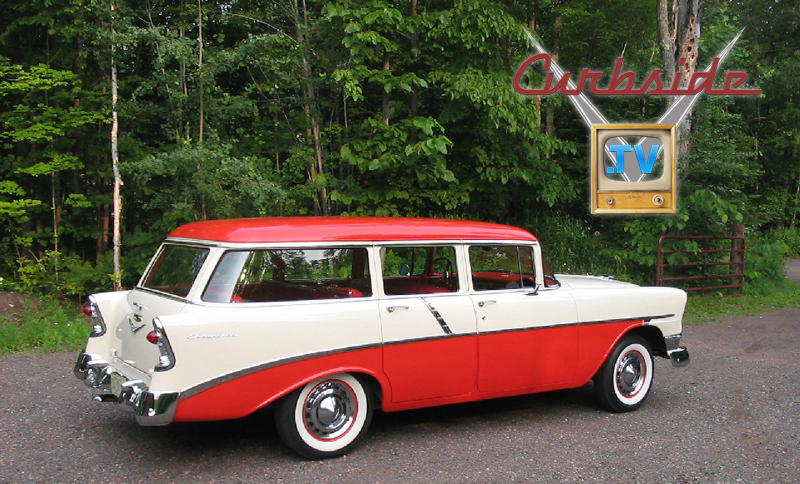 In this case Joe’s car started life as a 1956 Chevrolet four-door wagon. In the 1950s a wagon was a very utilitarian vehicle that mom would drive to the store and it’s only been recently that wagons have started to elicit a great deal of interest among collectors, maybe some of whom rode in the back without a seatbelt making funny faces at the drivers following the car in their youth. By the time Joe found this vehicle the conversion to a pickup truck had already begun but the quality of the work left a lot to be desired, not to mention the fact that it was very, very incomplete. While some collectors might have looked at the work needed to create a finished project and given up, Joe saw an opportunity to create something truly unique and went forward. Truth be told, Joe has the nicest collection of tri-five Chevrolets that I know of including some beautifully restored originals and some terrific hot rods. This is also not the only “El Camino” in his collection of tri-five Chevys and I will feature his other one in the future - it’s completely different from this one. But to create this one, Joe’s team took the rear wrap-around windows from the wagon and shortened them. Then they put them behind the front doors giving the cab of the truck extra room. The rear window of the cab is actually the glass from the tailgate window of the wagon. Behind the window is a beautifully-finished bed which matches the beautifully-finished interior. If it appears that the entire bed of the truck is padded, your eyes do not deceive you. 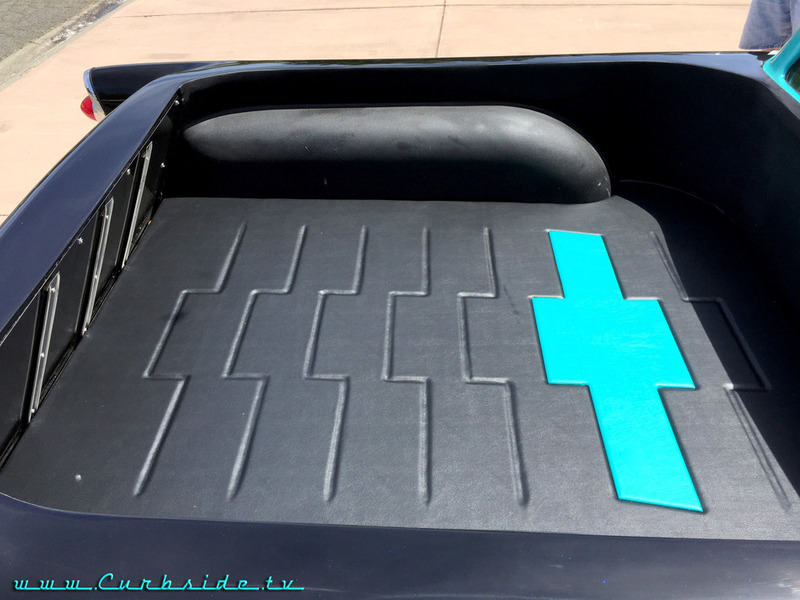 The turquoise and black upholstery in the bed match the interior and the upholstery is a terrific job completed by Al’s Upholstery in Clearlake. While the original idea was to have the tailgate drop down, the original tailgate was such a mess that it was decided to simply finish into place. “This makes the bed like a big hot tub - all you need to do is add pin-up girls and you’re set!” said Joe. That’s a good idea. The body itself Joe describes as relatively simple but the pictures might deceive you into thinking there’s elaborate chrome detailing, typical of a 1956 Chevrolet. In fact, that’s a three-dimensional paint effect crafted by Aragon Customs in Clearlake Oaks who did all the paint work. Aragon did the majority of the finishing body work on the car and the paint as well and it’s quite impressive to see it in person - the simulation they did of the chrome is pretty incredible. 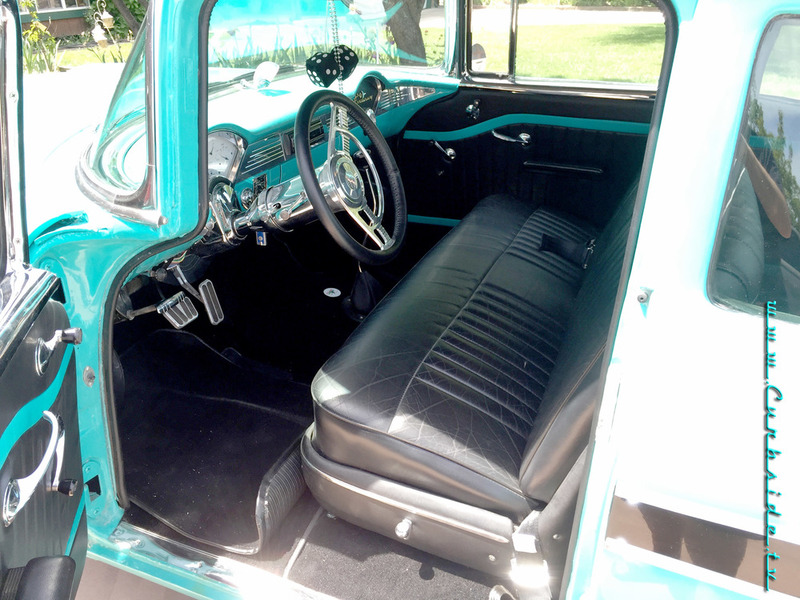 The upholstered bed of Joe's 1956 Chevrolet El Camino which matches the beautiful upholstery in the interior. 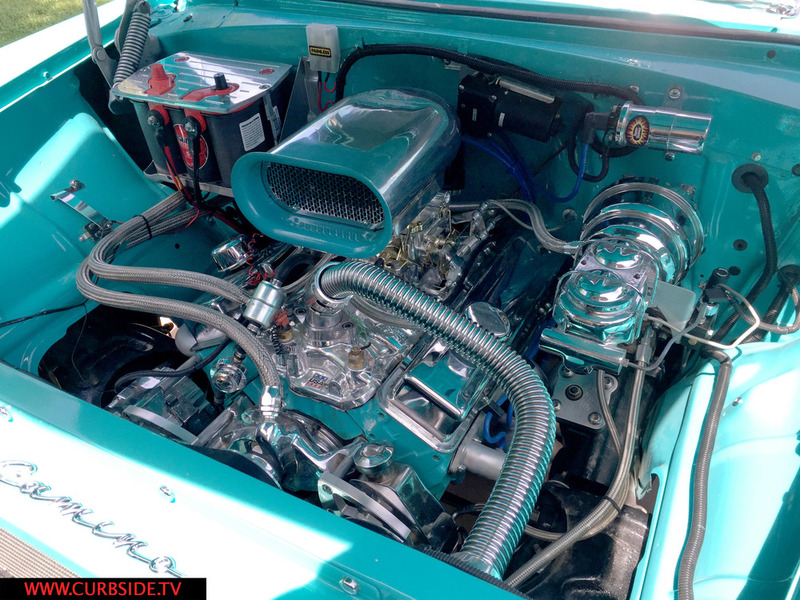 Of course all that “bling” you see under the hood is the genuine article. Joe is a master of eBay and he was able to score all those shiny bits at prices he describes as pretty great. Whatever was paid, the final result is an engine compartment that can brighten a cloudy day with all the shiny parts. Under those parts is a 305 V8 mated to a 350 transmission and Joe describes the car as a great, reliable driver. Joe’s not the only person who’s created an El Camino where there wasn’t one before. The idea started with Harley Earle, master GM stylist, who had a car-based pickup on the Autorama circuit in 1957 according to Joe. I’ve seen pickups crafted from a variety of passenger cars including several Corvair-based pickups (not the original Rampside or Loadside, but pickups based on the Corvair Wagon). 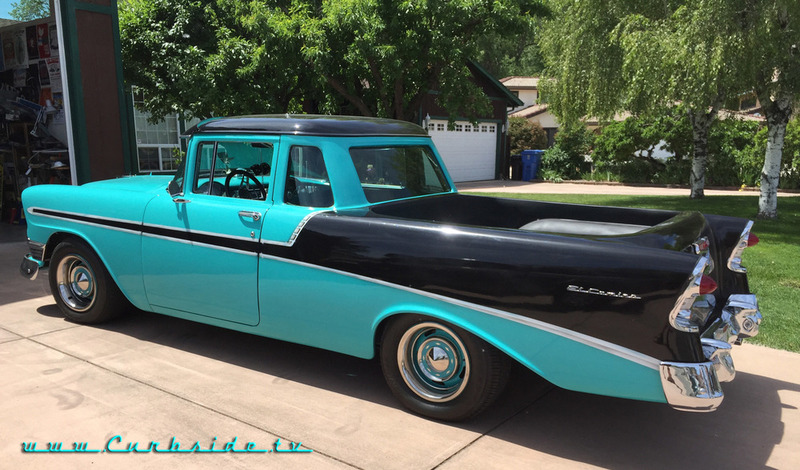 On Barrett-Jackson a pickup based on a 1958 Pontiac just crossed the blocks and Joe indicated that there are a few dozen on discussion forums around the country. So what happened to the idea of a car-based pickup? By the 1980s passenger cars were no longer able to tow much so vehicle manufacturers began offering more and more luxury options in their pickup models. Pretty soon the level of refinement of pickups matched that of cars and today a pickup truck is every bit as pleasant to drive as any passenger car with interiors that can rival many luxury brands. The added bonus of being able to haul thousands of pounds of trailer or just stuff makes today’s pickup a very desirable vehicle so the demand for one based on a less-capable passenger car platform doesn’t justify the cost of putting one into production. Chevrolet also realized that truck buyers wanted a more car-like vehicle and introduced the Cameo pickup in 1955, which offered a more stylish exterior, more plush interior and V8 power. While not popular in 1955, the Cameo is a hot commodity today with collectors. But that doesn’t mean that a few creative individuals with an eye for design and a love for having something unique aren’t out there crafting their own car-based pickups. Considering what a great platform the tri-five Chevrolet is Joe is definitely not the only one who has been working on this idea but the final product he’s created in this 1956 custom El Camino is going to give others with this idea a good run for their money when it comes to creating a captivating final product. At least there’s lots of cargo space to haul home the trophies. If you have a car that's part of your history it would be an honor to feature it and you here on the Curbside. Just contact us and let us know how we can reach you.